Moving can be fun, but it can also be overwhelming considering the amount of work required for a successful experience. A primary example of this is packing up your furniture. With the right materials in place, you can pack your furniture pieces carefully and safely. If you’re looking to survive the relocation in good shape, here are eight ways to prepare your furniture when moving. Figure out what you have to move. When moving, the first thing you should do is to take an inventory of all the furniture pieces you need to relocate. When it comes to larger pieces, it’s important to figure out how much time you will take to prepare and disassemble everything. The items you want to be taken apart may include the beds, tables, wall cabinets, and desks. In addition to bigger pieces, you also have to carefully disassemble fragile items to make sure you’ll move them easily and quickly. Take photos of the disassembling process. Of course, you need to reassemble the pieces of furniture once you arrive at your new location. That said, it’ll be a good idea to take a picture of each piece while you take them apart. That way, you’ll be able to remind yourself of what these items look like. Remember, you can get multiple photos to document each step of the process so you can use it as a reference when you put the furniture back together. Before placing your furniture pieces in the truck, you should wrap them in some protective materials. Once you’ve finished creating the inventory, it’s important to think about the things you need to pack and move each piece. For instance, buy some packing supplies including bubble wrap, covers or blankets, packaging tape, and markers. With these materials, you’ll be able to keep your furniture items safe and secure during the move. However, if you want to ensure the safety of your belongings throughout the moving process, it’s wise to hire an experienced moving company that will help protect your furniture and ensure a smooth relocation for heavier pieces. Take measurements of the doorways and hallways. Moving furniture from your old house can be made easier if you measure the doorways and hallways. Doing so will help you determine whether you can move an item without taking them apart. Sometimes, there are pieces of furniture that don’t have to be disassembled, but for larger ones such as sofas and couches, you may be required to take off your door before moving them. Generally, the best thing to do is to ensure that every piece you move out will fit through hallways and doorways. That way, you’ll prevent these items from possible damage. This means you have to prepare your pieces for disassembly. Always keep in mind that this process is indeed time-consuming, which is why the best time to do them is when you feel more energetic. Start the disassembly one at a time. Take a look at the furniture and study how you’re going to take them apart. In particular, check all the parts that can be disassembled such as the table legs, bed frames, shelves, or glass tops. Along the process, make sure to keep the bolts, nuts, and washers in the plastic bag. Label on the outside which furniture piece it belongs including the tools needed for the reassembly. For better protection when moving, it’s vital to cover furniture with pads or blankets. Apart from buying some moving sheets, you may use old blankets that you have. Be sure to wrap the top and bottom of the piece and then its entire circumference. Take note that for larger furniture items, you should get ready with multiple pads or blankets. Protect highly valuable and fragile pieces. You should always pay attention to protecting fragile items when moving out. Thus, if you want an extra layer of protection for these things, cover them with an additional bubble wrap on top of the plastic cover. Wrap it around the whole furniture and seal it with tape. This method will reduce your worries about scratches and other damages to your highly valuable possession. Load pieces of furniture on the moving truck. If you’re moving on your own, make sure you have an idea on how to load the truck carefully. For instance, spread the weight of your possessions so it’ll not be difficult to steer the truck while traveling. Load the heavy items at the back of the truck to keep the space in the middle accessible for loading and unloading. However, if you hire movers, you have nothing to worry because they’ll handle the loading and guarantee that all your furniture will arrive safe and undamaged to your new home. In reality, moving furniture pieces is a daunting task. 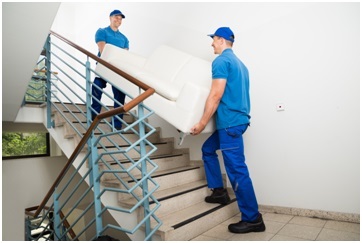 It’s even more challenging to move without professionals like Movers NYC by your side. Keeping these ways in mind, we hope you’ll be able to prepare every piece of furniture properly, ensure their protection against damages and make moving much more manageable.